We understand that schedules change. However, aim to provide a smooth experience for all involved, including researchers and participants. We ask that researchers provide participants with 24 hours notice if they need to cancel or reschedule sessions. Participants canceled or rescheduled by a researcher must be marked as such. 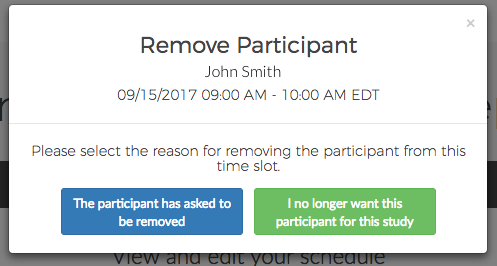 This means that you must select "I no longer want this participant" or "I need to cancel this participant". If we find that you have canceled participants, claiming they asked for it when they did not, we will follow up with both parties and make any necessary adjustments to the project. Participants who are asked to reschedule by the researcher and can not make a different session will be considered canceled. If a researcher cancels a participant or asks them to reschedule (and they are unable to), they will incur our cancelation fee. 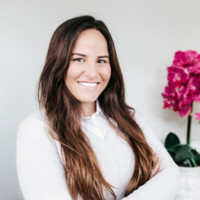 The cancelation fee includes the participant recruit fee (paid to us for having scheduled the participant) and 25% of the incentive (paid to the participant for the inconvenience). If you are paying by credit card, a 3% processing fee will be added on top of the partial incentive. These fees will be added to your final bill. For example, an upcoming study recruiting consumers is paying a $40 incentive. If a confirmed participant is canceled, the researcher will incur a $30.30 charge for this participant. This includes the recruitment fee ($30), the inconvenience fee that's sent to the participant ($10), and a 3% processing fee on top of that partial incentive ($0.30). Log into your account and visit your active project. From the left-hand menu, click "Confirmed sessions" under the Schedule section. If a session is in the future, you will see two links next to each participant: "Reschedule" and "Remove". If a session start time has passed, you will see two new buttons: "Completed" and "Did Not Show". You will no longer be able to remove or reschedule participants. Find the participant within your confirmed participant lists and click "Remove" to the right of their name. Select the "I no longer want this participant" option. We'll issue the cancelation fee as an Amazon gift card equivalent to 25% of the dollar amount they would have received in compensation, regardless of if the study was set to "Researcher pays" or "UI pays" and regardless of original incentive type. To remove a participant, select "I no longer want this participant for this study". Important Note: Whenever you select on behalf of the participant (such as selecting "the participant asked to be removed"), both the participant and User Interviews will be notified. We will follow up with both parties, determine the appropriate next steps, and make any necessary adjustments to the project. Scroll down to the participant's name, and click "Reschedule" to the right of their name. Select the "I no longer want this participant" option. From here, there are two options. Click the button that says "Ask the participant to select a new time." The participant will receive an email asking them to select a new spot. If they select a new spot, we will not issue them the inconvenience fee. If they don't select a new spot or can no longer make it, they'll earn the inconvenience fee. If you have agreed on a new date/time, you can reschedule the participant yourself. Select a date and time from the list of options. The participant will receive the confirmation email. If they are willing and able to reschedule, we will not issue them the inconvenience fee.